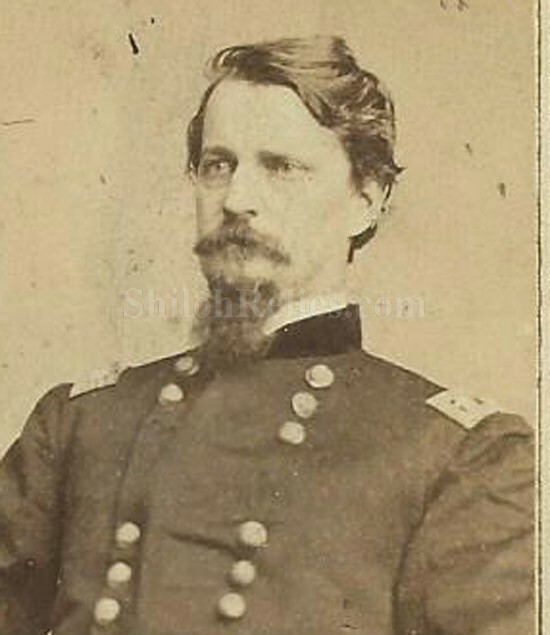 This is a great looking original Civil War era CDV image of Union General Winfield Scott Hancock (1824-1886). The face of the card is a bust view image of the General in his Major General uniform with the pencil inscription identification down below. Winfield Scott Hancock was born on February 14, 1824 in Montgomery Sq., Pennsylvania. He graduated from West Point Military Academy with the class of 1844. His 1st service was in the Indian territory and then during the Mexican war and also he took part in the Seminole war and the Utah Expedition. On September 23, 1861 he was appointed to the rank of Brig. General. On November 29, 1862 he was promoted to the rank of Major General. He fought bravely during the battles of Fredericksburg and Chancellorsville. On July 1, 1863 he commanded the Union troops at the battle of Gettysburg. His strategies during this battle helped to secure the Union victory. While fighting during Pickett's charge a bullet went through the pommel of his saddle and into the general's thigh. He returned from his wounds to fight with Grant at Petersburg, the Wilderness, Spotsylvania, Cold Harbor. He died on February 9, 1886 and is buried in Norristown, Pennsylvania. The overall size of a CDV image is approximately 2.5 inches by 4 inches in size. 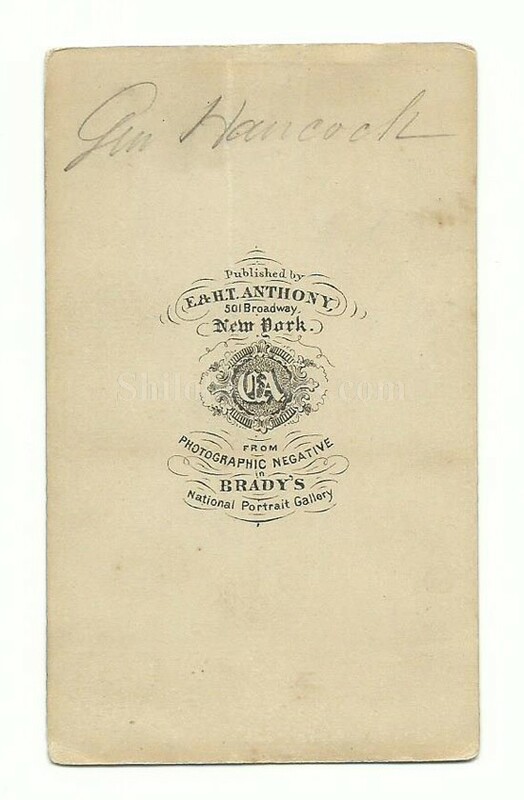 On the back of the card it has the photographer mark of the New York firm of Anthony and notes that it was made from a negative of Matthew Bradys. It is a nice touch on an already wonderful image. 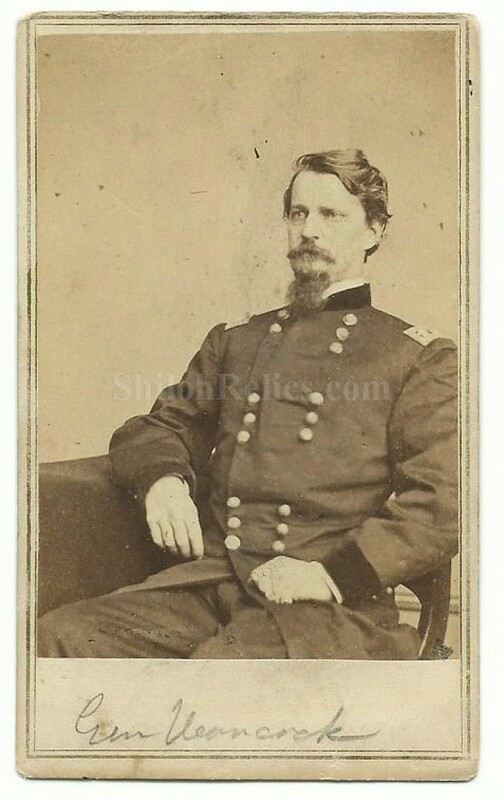 This is a great looking image of one of the hard fighting Union Generals.